Find a fragrant bouquet of roses. Purchase a gift card from mom’s favorite store. Pick up grandma and take her out for an afternoon outing of tea and scones. However you choose to celebrate Mother’s Day this year, remember that acknowledging the importance of parenting goes beyond gift giving and the heartfelt attentions of this once-a-year day. Secular holidays, like Mother’s Day, are special days when we focus collectively on the stories we tell ourselves about who we are, where we’ve been, and, most importantly, the values we share. Let’s talk first about the good news. The good news is that unlike some of the other divisive social issues of our time—like climate change, gun violence, health care, or the right to choose—there is near-universal agreement on the importance of the bond between parent and child that begins moments after birth and continues deepening during the days, weeks, and months that follow when the newborn is the most vulnerable and needy. Not surprisingly, psychologists now tell us that the first few weeks of life are among the most determinative for a person’s lifelong sense of well being—an observation that mothers (of course!) have intuited for generations. Now for the bad news. The United States has the dubious distinction of being the only industrialized nation in the world—and only one of four nations in total—that does not acknowledge the importance of the first few months of life by mandating paid maternity or parental leave. Belonging to that club, which includes Lesotho (where 40% of the population lives below the international poverty line), Swaziland (a lower-middle-income country), and Papua New Guinea (where 33% of the population lives close to the international poverty line), should make us cringe with embarrassment or weep with frustration. An infographic pulled together by The International Labour Organization should be required viewing for everyone this Mother’s Day. The holiday is as good a time as any to do a reality check. The chart shows how the United States, the sixth wealthiest nation in the world where women make up 47% of the work force and working mothers are the sole breadwinners for 40% of American families, stands alone in neglecting to acknowledge and support the essential contribution of parents of the newly born. In the world beyond our borders in 178 countries, paid leave is guaranteed for working mothers. 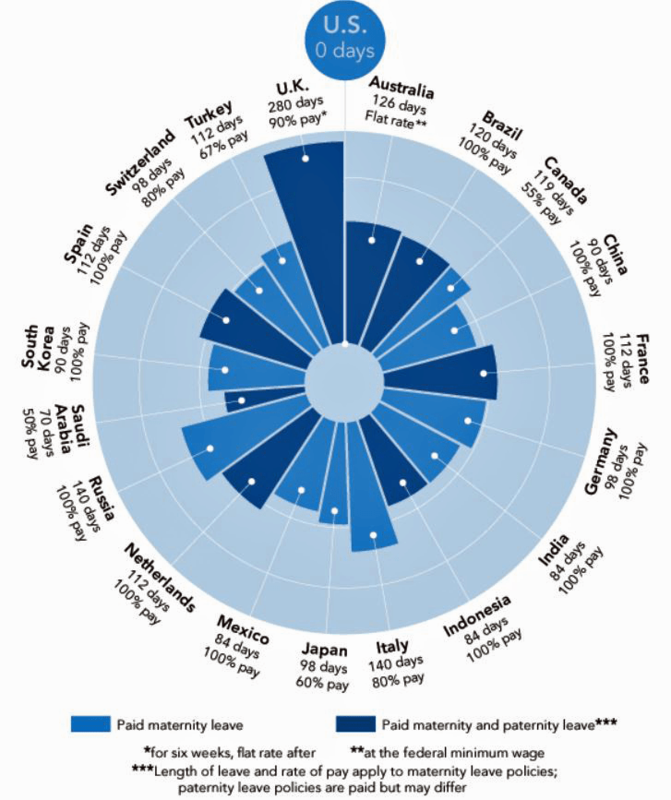 In 50 countries, paid leave is guaranteed as well for working fathers. In those enlightened places. new parents can choose to focus their energy and attention on their newborn babies, at least during the first three months of life, and still be secure in the knowledge that they’ll be paid either 100% or 80% of their salaries. new parents face the wrenching choice between the responsibility and desire to care for their newborns themselves or the financial necessity to keep the weekly paycheck coming. After seeing this chart, can anyone with a conscience ignore the facts? On this Mothers’ Day, I can think of no better way to honor our mothers than to advocate for paid maternity leave. And if you assume that a single voice like yours or mine makes no difference, remember that Mother’s Day was conceived by three determined and heroic women activists. Here are their names. Ann Reeves Jarvis, a West Virginian who, in 1858, organized Mother’s Work Days that focused on improving sanitary conditions in her community and curbing the contamination of milk in an attempt to lower infant mortality rates. Julia Ward Howe, poet, pacifist, and suffragist, who organized a day in 1872 for mothers to advocate for peace following the Franco-Prussian War. Anna Jarvis, daughter of Ann Jarvis, who campaigned tirelessly for her mother’s vision and saw her efforts succeed when she and others organized the first Mother’s Day observances in 1905.